CBC Ohio Blood Donor Awareness Month t-shirt. JACKSON CENTER — The Jackson Center United Methodist Church will host a community blood drive on Tuesday, Feb. 5, from 2 to 6 p.m., at 202 E. Pike St., Jackson Center. The blood drive comes during the heart of winter and continues the theme of Ohio’s first Blood Donor Awareness Month. Everyone who registers to donate will receive the commemorative “Ohio Blood Donor Awareness Month” t-shirt. Schedule an appointment online at www.DonorTime.com or call 1-800-388-GIVE. CBC has an immediate need for blood donors to maintain the blood supply during the challenging winter season. CBC is also emphasizing the strategic goals in 2019 of identifying and recruiting new platelet and plasma donors. 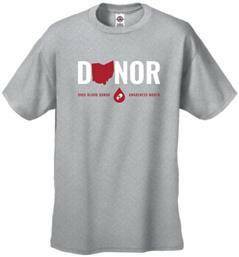 The commemorative Ohio Blood Donor Awareness Month t-shirt is grey with a red map of Ohio. It’s free when you register to donate at the Dayton CBC Donor Center or any CBC mobile blood drive. CBC is offering the commemorative shirt through March 2 so more donors will be eligible to receive it. Blood donor and emergency room physician State Sen. Steve Huffman, from Tipp City, sponsored the legislation to make January Ohio Blood Donor Awareness Month. CBC played an important role in its passage by providing proponent testimony. CBC is expanding the opportunity to donate platelets and plasma at select community blood drives. Platelets are the cells that control bleeding while plasma is the fluid that maintains blood pressure. Both are vital for the treatment of cancer, trauma, organ transplant, and burn patients. New platelet donors are in high demand, especially those with blood types A, AB, or B positive. Find out more at www.GivingBlood.org or talk to an apheresis specialist at (937) 461-3220.
https://www.sidneydailynews.com/wp-content/uploads/sites/47/2019/01/web1_image007.jpgCBC Ohio Blood Donor Awareness Month t-shirt.